Hello my lovelies and welcome to my new post! I am very happy to share with you some of my summer essentials when it comes to eye-wear. Trends when it comes to sunglasses are also changing, so I always try to keep up with the latest designs from my favorite sunglasses brand, Emblem Eyewear. I am here today to share with you my summer favorites! 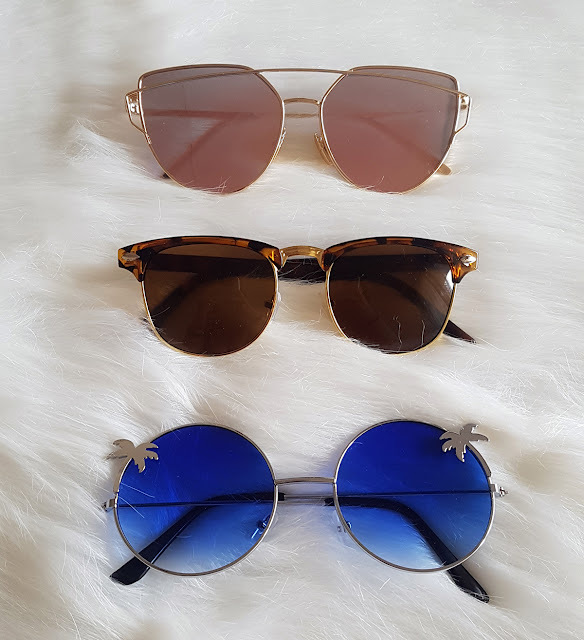 First of them are these super trendy cat eye mirrored flat lenses aviator sunglasses metal frame womens shades that I wore so many times I am sure you've notices them on my instagram. This is a perfect choice for the beach, for vacation or going to town, they are the trendiest item i own right now. My second favorite pair of sunglasses for the summer are these classic half frame vintage inspired horned rim sunglasses that I am rocking in one of the outfits you will soon get to see. These sunglasses have an adorable classic vintage vibe. They are easy to wear with many outfits on daily basis. If you are a fan of these prints and half frames, these are the ones for you. Last but not least, I am a sucker for a hippie vibe. These indie palm tree gradient lens round hippie sunglasses are so chic and I am in love with the palm details on the side! Round shape adds the edge to any outfit you are wearing these sunnies with. That is all for today my lovelies! What are your favorites from Emblem Eyewear? Do you like what I picked out? What kind of sunnies are you wearing this summer? Let me know!